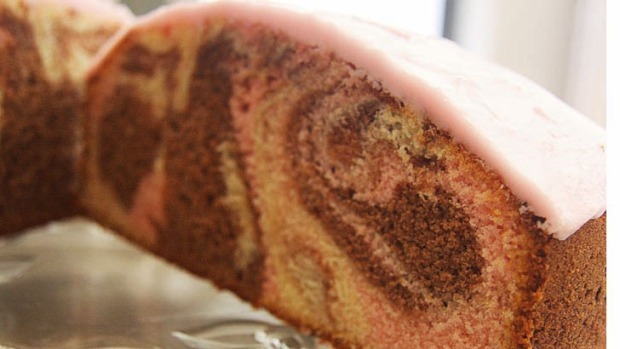 Tanya McArthur's championship ribbon winning marble cake. In writing The Australian Blue Ribbon Cookbook, Liz Harfull's aim was to preserve first hand knowledge of recipes in danger of being forgotten. To do this, she tapped into the expertise of the women and men who compete in country shows, sharing 70 of their recipes. Lexie Young first competed in the open cookery section of the country show at Deloraine, Tasmania more than 50 years ago. Among the awards she took home was a first prize for her jelly cakes. She has been using the same recipe ever since, making thousands of the small cakes over the years for shows, family and community events. Melt the butter to measure it - 3 tablespoons should be about 45 grams. Getting the consistency of the jelly right is critical. If it sets too much, it won't coat the cakes evenly; if it is too runny, it will soak into the cakes and stain them. Check the jelly regularly. The unfilled cakes freeze well. Classics ... 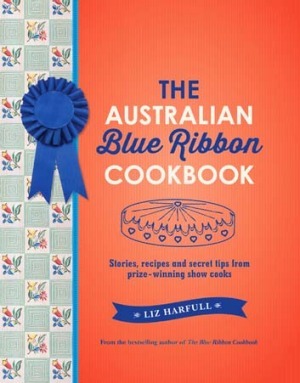 The Australian Blue Ribbon Cookbook by Liz Harfull. 1. Preheat the oven to moderate (180C). Grease two gem irons well. Alternatively, place 24 small patty cases on two baking trays. 2. Put the butter, egg and sugar in a medium-sized mixing bowl. Beat until light and fluffy and the sugar is completely dissolved. Add the flour and the milk and mix until thoroughly combined. Jean Biggins with her jam sponge roll. 3. Drop a small tablespoonful of the mixture into each gem-iron mould or patty case, so they are about three-quarters full. Bake in the oven for about 10 minutes, or until your fingertip does not leave a lasting impression when you lightly touch a cake. 4. Run a knife around the edges of the gem-iron moulds and remove the cakes immediately, or remove the patty cases. Place the cakes on a clean tea towel to cool. 5. Meanwhile, make the raspberry jelly. Put the jelly crystals in a bowl, add the boiling water and stir until the crystals are thoroughly dissolved. Add the cold water and stir. Refrigerate until the jelly is partially set, with a thick custard-like consistency. Start checking the consistency after about an hour. 6. When the cakes are cold, dip them in the jelly, turning them with a fork to make sure they are coated evenly. 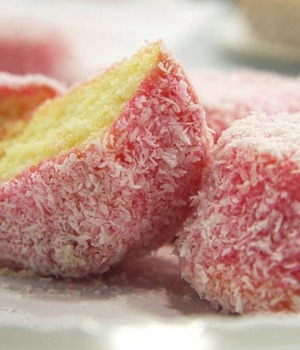 Lift them out with a fork, shake off any excess jelly and roll them in the coconut. Using the fork, lift them onto a plate lightly sprinkled with more coconut. 7. Place the plate of jelly cakes in the fridge to set. 8. To serve, cut the jelly cakes in half and fill with the whipped cream. Tanya McArthur won the prestigious red, white and blue championship ribbon with gold tassels for cookery at Canberra's centenary year show in 2013 with this recipe. When flouring the cake pan, tap away any excess flour so it does not form a 'skin' on the cake. It is extremely important that the eggs and milk are at room temperature, or the batter will curdle. Food colouring paste or gel gives a better result in tone and colour than liquid colourings. Use a skewer to add the paste a little bit at a time. Do not overuse the knife to swirl the mixture or it will create a mess, rather than a pleasing marbling effect. Lift the knife just a few times as you are swirling, to bring the colour up in a steep wave. 1. Preheat the oven to moderate (180C). Grease and flour a deep, 20-cm round cake pan. Line the base with greaseproof paper. 2. Cream the butter and sugar in a medium-sized mixing bowl until light and fluffy (about 10 minutes using an electric mixer set on high). Beat in the vanilla until combined and then add the eggs one at a time, beating well after each addition. 3. Sift together the plain and self-raising flours, three times. Stir the flours into the butter mixture in three small batches, alternately with the milk. Beat until well combined and pale yellow in colour. 4. Divide the mixture evenly between three bowls. Sift the cocoa powder into one and stir until combined. Add small amounts of pink food colouring to another bowl, making sure the depth of tone is similar to the chocolate mixture. the same colours are not on top of each other. Using a knife, gently swirl the colours together, running the knife through the mix only a few times to create a marbling effect. 6. Tap the pan on the benchtop two or three times to settle the mixture, then bake for 50 minutes until the top is firm. 7. Leave the cake to cool in the pan for 5 to 10 minutes, then turn out onto a wire rack, covered with a clean tea towel, to cool. 8. When the cake is completely cool, decorate the top with the pale pink icing. 9. To make the icing, sift the icing sugar mixture into a small bowl, and add the butter. Stir in a little boiling water at a time, mixing until the icing is smooth and a thick, spreadable consistency. Add enough food colouring to make the icing a similar tone of pink to the cake mixture. 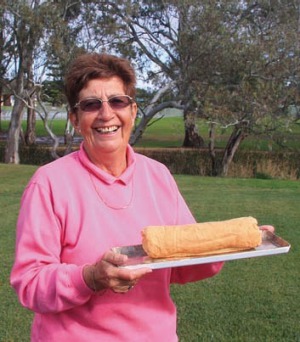 Jean Biggins has made this sponge roll recipe so many times she knows it by heart. The recipe came from a community cookbook she picked up many years ago in Loxton, and she has used it to win at the Royal Adelaide Show as well as country events. Judging the cooking time is critical. The sponge should be just cooked, and only lightly brown. If it's overcooked or the ends are crispy, it will not roll properly. Make sure the tea towel has no creases. You may need to lean a knife across the top of the roll while it is cooling, to hold it in the right position, with the seamside underneath. 1. Preheat the oven to moderate (180C). Grease a Swiss roll pan (30 × 25 cm) and line the base with greaseproof paper. 2. Place the egg whites and salt in a medium-sized bowl and beat until soft peaks form. Add the sugar gradually, beating until it dissolves and the mixture holds its shape when formed into stiff peaks. Gently stir in the egg yolks one at a time, until combined. 3. Sift together the flour, cornflour, custard powder, bicarbonate of soda and cream of tartar, and fold them into the egg mixture very gently. 4. Pour the mixture into the prepared pan. Bake for about 15 minutes, until pale golden brown and slightly springy to the touch. 5. Quickly turn the sponge out onto a damp tea towel. Using the tea towel, and working from one of the narrow ends, roll up the tea towel and sponge together. Hold them in position for about 30 seconds, then unroll them. Roll the sponge up again immediately without the tea towel and set it aside to cool on a piece of baking paper, resting on its lip. 6. Once it is cool, open up the sponge roll. Spread it very lightly with the raspberry jam, then roll it up again. Create a chocolate sponge roll by replacing the custard powder with cocoa powder. Fill with cream instead of raspberry jam. This is an edited extract from The Australian Blue Ribbon Cookbook by Liz Harfull, published by Allen & Unwin, RRP $39.99.